mercury lamps, metal halide lamps, and high-pressure sodium lamps. All high-intensity-discharge lamps produce light from an arc tube that is usually contained in an outer glass bulb. Figure 6-14 shows the basic configuration of a HID lamp. In these lamps, a material, such as sodium, mercury, or metal halide, is added to the arc tube. In design, the lamp has three electrodes - one acting as a cathode and the other as an anode with the other electrode being used for starting. The arc tube contains small amounts of pure argon gas, halide salts, sodium, and vapor to aid in starting. Free electrons are accelerated by the starting voltage. In this state of acceleration, these electrons strike atoms and displace other electrons from their normal atomic positions. Once the discharge begins, the enclosed arc becomes the light source. Figure 6-14. - HID lamp configuration. substantially greater as these lights will require ballasts; however, this cost can be made up later by the savings of energy costs. The selection of lighting fixtures will depend on budgeted dollars for new installation projects versus maintenance dollars. Most discharge lighting fixtures are supplied with the required ballast installed in the fixture. In some cases ballasts, usually called transformers, are externally installed. This lamp consists of a quartz arc tube sealed within an outer glass jacket or bulb. The inner arc tube is made of quartz to withstand the high temperatures, resulting when the lamp builds up to normal wattage. Two main electronemissive electrodes are located at opposite ends of the tube; these are made of coiled tungsten wire. Near the upper main electrode is a third, or starting, electrode in series with a ballasting resistor and connected to the lower main-electrode lead wire. 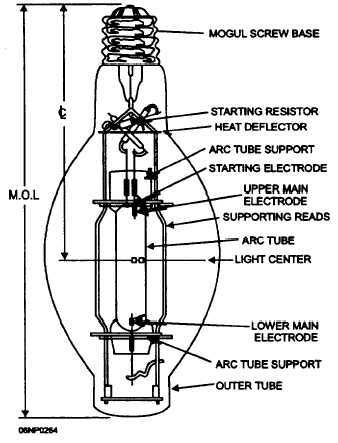 The arc tube in the mercury lamp contains a small amount of pure argon gas that is vaporized. When voltage is applied, an electric field is set up between the starting electrode and the adjacent main electrode. This ionizing potential causes current to flow, and, as the main arc strikes, the heat generated gradually vaporizes the mercury. When the arc tube is filled with mercury vapor, it creates a low-resistance path for current to flow between the main electrodes. When this takes place, the starting electrode and its high-resistance path become automatically inactive. Once the discharge begins, the enclosed arc becomes a light source with one electrode acting as a cathode and the other as an anode. The electrodes will exchange functions as the ac supply changes polarity. The quantity of mercury in the arc tube is carefully measured to maintain quite an exact vapor pressure under design conditions of operation. This pressure differs with wattage sizes, depending on arc-tube dimensions, voltage-current relationships, and various other design factors.